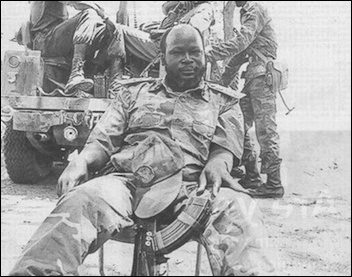 John Garang, commander of the Sudan People's Liberation Army (SPLA). The great challenge for Christianity in the Sudan, especially in the southern part of the country, is closely linked to the civil war between Sudan's North and South. This war has raged intermittently since 1955, making it possibly the longest civil conflict in the world. It continues unabated, mostly outside the focus of diplomacy or the attention of international media, taking a huge and terrible human toll. Over two million people have died as a result of the war and related causes, such as war-induced famine. About five million people have been displaced, while half a million more have fled across an international border. Tens of thousands of women and children have been abducted and subjected to slavery. By all accounts, it appears to be the worst humanitarian disaster in the world today. Religion is the pivotal factor in the conflict. The North, with roughly two-thirds of Sudan's land and population, is Muslim and Arabic-speaking; the Northern identity is an inseparable amalgamation of Islam and the Arabic language. The South is more indigenously African in race, culture, and religion; its identity is indigenously African, with Christian influences and a Western orientation. Although Christianity predated Islam in northern Sudan, it was effectively eradicated and replaced by Islam by the early sixteenth century. It was then introduced to the southern part of the country through missionary work that was associated with British colonialism. Since independence, the South has been threatened by the policies of Arabization and Islamization. Paradoxically, the religious persecution of non-Muslims has the effect of promoting Christianity; Southerners now see Christianity as the most effective means of counteracting the imposition of Islam, especially as traditional religions cannot withstand the forces of spiritual and religious globalization. Paradoxically, the religious persecution of non-Muslims has the effect of promoting Christianity, which Southerners now see as the most effective means of counteracting the imposition of Islam. The civil war culminates a long history in which the North has tried to spread its religion and language to the South, which has resisted these efforts. The North's identification with the Middle East is an ancient one, going back several thousand years, to the time when Egyptians and Arabians expanded southward in the search for slaves, gold, ivory, and taxation revenue. Christianity entered the scene in the sixth century A.D. and became the religion of three kingdoms (Nubia, Magarra, and Alwa) that survived for a thousand years. The introduction of Islam a century later, primarily by traders, then led to descent groups in Sudan tracing their genealogy back to Arabia; in the case of politically or religiously prominent families, they claim to have roots going back to the Prophet Muhammad himself. Islamization set in motion a process of gradual decline for Christianity in northern Sudan, culminating in the overthrow of the Christian kingdoms in 1504 by an alliance of Arabs and the Muslim kingdom of Funj. In due course, Islam and Arabic gained hold in the North and overshadowed the indigenous and Christian cultures. Islam in northern Sudan was later reinforced by every successive regime, from the Ottoman-Egyptian administration that invaded the country in 1821 to the Mahdist Islamic revolution that overthrew it in 1885, and even to the Anglo-Egyptian Condominium that ruled the country from 1898 until Sudanese independence in 1956. While Arabs could invade the South to capture slaves, they never penetrated deeply and did not settle. Swamps, flies, mosquitoes, tropical humidity, and the fierce resistance of the people kept contact to a minimum, even as it was devastatingly violent. Arabs were interested in the material value of blacks as slaves and so had no wish to integrate with them (in contrast to their pattern of settling down with Northerners); had the southern Sudanese converted to Islam, it bears noting, Arabs could no longer have engaged in legal slave raids against them (given that Islam prohibits the enslavement of fellow Muslims). In sharp contrast, the identity of southern Sudan has been shaped primarily by the prolonged resistance to the imposition of Arab and Islamic culture from the North. This has had the effect of unifying the Southerners as black Africans and has geared them toward Christianity and the English language as means of combating Islam and Arabism. The identity of southern Sudan has been shaped primarily by the prolonged resistance to the imposition of Arab and Islamic culture from the North. In contrast to the Arabs, the British were associated with the redemption of the South from the Arab slave raids. The British sought first to suppress the trade in slaves through their influence on the Turko-Egyptian administration, then, after the re-conquest of the Sudan in 1898, to abolish it; also, British occupation meant that the North's efforts to spread Islam southwards were confined to urban centers and in the end were significantly frustrated. In sharp contrast to the Muslims, Christian missionaries came to southern Sudan peacefully. They arrived with the British conquest of Sudan, encouraged by London to spread the Christian gospel through pacific means, largely by providing education, health services, and other social services. To avoid sectarian competition, the British administration allotted each sect spheres of influence for its missionaries. Over the next century, Christian missionary activity came to be associated with personal well-being and socio-economic development, positive incentives which won over many new converts. Despite this, southern Sudanese tended to receive Christianity favorably, for they associated it with peaceful preaching and the benefits of modern education and medical services. Christianity also benefited from the sense that Europeans had come to rescue the Southerners from enslavement by Arabs. This understanding was, of course, a bit innocent, for some nineteenth-century Europeans were in fact engaged in the slave trade, but their involvement was hidden by their reliance on Egyptian or northern Sudanese middlemen whom southern Sudanese saw as the sole culprits. With independence in 1956, the northern-dominated government in Khartoum sought to Arabize and Islamize the South. It had two motives: a belief that homogenizing the country would ensure national unity and a desire to spread what they considered to be a superior civilization. Some Southerners did convert, whether out of conviction or for other reasons, but most resisted. A civil war between North and South had already begun a year before independence, in 1955, continuing until the Addis Ababa agreement of 1972 granted regional autonomy to the South. Although the issue of a constitution in conformity with Islam had been debated since independence, President Ja'far Muhammad Numayri's presidential decree of September 1983, imposing Shari'a (the sacred law of Islam) on the country placed the issue squarely on the public agenda, leading to increased tensions and eventual conflict between the government and rebels in the South. The conflict resumed in 1983 when the Khartoum government unilaterally abrogated the Addis Ababa agreement, divided the South into three regions, reduced the powers of the regional governments, and imposed Shari'a on the whole country, including the non-Muslim South. The South fought under the leadership of the Sudan People's Liberation Movement and its military wing, the Sudan People's Liberation Army (SPLM/SPLA). The rebellion was triggered when the government attempted to transfer southern battalions to the North, thereby removing their capacity to resist. The rebels fled to Ethiopia, where they received strong support which helped them organize themselves and equipped them militarily, turning them into a strong force against the government. Although the SPLM/SPLA is composed largely of Southerners under Christian leadership, it was later joined by non-Arab ethnic groups from the North and liberal-minded Northerners who share with the movement a vision of a secular, democratic Sudan. Then, after Numayri's ouster in 1985, the Muslim Brethren, an elite Islamist group, metamorphosed into a broader-based political party, the National Islamic Front (NIF). The NIF shot to prominence in the parliamentary elections of 1986, winning the third largest number of seats. The group's Islamic agenda was endorsed and reinforced by General 'Umar Hasan al-Bashir, who seized power on June 30, 1989, in the name of the "Revolution for National Salvation." Initially, Bashir projected himself as independent from the NIF, although he shared its Islamist agenda. In due course, however, it became clear that the coup d'état was in fact engineered by the NIF and that Hasan at-Turabi, the NIF's leader, wielded the real power with Bashir not much more than the executor of his will. Recently, however, a conflict over power has ensued between Bashir, supported by young hawks from Turabi's camp, and Turabi, joined by some loyal NIF members and new supporters. While the struggle continues, Bashir appears to have the upper-hand while Turabi is significantly marginalized within the system. Their conflict has limited importance for the South, being internal to the Islamist agenda; both parties still agree that the South will only receive limited accommodation within an Islamic state. Since the resumption of hostilities in 1983, the relationship between religion and the state, in particular the role of Shari'a, has emerged as the central factor in the conflict. Religion on both sides defines identity. For Northerners, Islam is not only a faith and a way of life, it is also culture and ethnic identity associated with Arabism. For Southerners, Islam is not just a religion, but also Arabism as a racial, ethnic, and cultural phenomenon that excludes them as black Africans and adherents of Christianity and indigenous religions. Race in the Sudan is not so much a function of color or features, but a state of mind, a case of self-perception; the North identifies as Arab, no matter how dark its people's skin color. Religion defines identity in both the Sudan's North and the South. The close association between Islam and northern Sudanese nationalism would certainly rob Islam of an advantage [in the South] . . . [as] it remains beset by problems similar to those that limited the appeal of the SPLA's Africanism [in the North]. The clash of these two antagonistic cultural outlooks has implications that go beyond the borders of Sudan, for the two identity groups have affinities within and beyond Africa along both religious and racial lines that could potentially widen the circles of conflict. The Arab-Islamic world sees in northern Sudan an identity that must be, and has been, supported. For it, the South serves as a dangerous rallying point for Christendom, the West, and even Zionism to combat Islam. While this is largely an exaggerated conspiratorial construct, it provides a strong basis for Arab-Islamic solidarity with the North. On the other hand, black Africa sees in the plight of the South a humiliating racist oppression that must be resisted. While the commitment to African unity without racial or cultural distinctions inhibits overt support for the South, they have discreetly and clandestinely supported the SPLM/SPLA. The potential for an Arab-African clash over the Sudan remains real. There is no doubt that Sudan is as much a link as it is potentially a point of confrontation among converging diverse identities. The potential for an Arab-African clash over the Sudan remains real. From the North's perspective, the South is a legitimate domain for Arab-Islamic influence which the Christian missionaries, in alliance with British colonial rulers, wrongly usurped. Northerners believe that the roots of Christian and Western influence in the South are shallow and can easily be replaced by Islam and Arabic culture. Interestingly, just one year after independence, the government nationalized all Christian missionary schools in the South, causing them to lose their Christian character while allowing missionary schools in the North to continue to provide education to mostly Muslim students, albeit without proselytizing Christianity. The council of ministers decided in February 1960 to change the official day of rest in the South from Sunday to Friday. When southern schools went on strike in protest against that decision, the government retaliated by prosecuting the alleged ring leaders and imposing severe prison sentences on them. A native priest, Poulino Dogali, was sentenced to twelve years' imprisonment for having printed and distributed a leaflet critical of the government's decision. Two secondary-school students received ten years each for having instigated the students' protest. On April 8, 1960, several years before the expulsion of the missionaries, the daily Ra'i al-'Amm newspaper urged northern Sudanese to join efforts with the government to proselytize Islam in the South: "There is no doubt that many in this country know how much need Islam has in the South of efforts on the part of the government. The administrative authorities and men of the Ministry of Education and of the Department of Religious Affairs continue to make gigantic efforts; but this by itself is not enough." Since 1964, the situation has vacillated from moments of improvement to a return to confrontation and the persistent commitment of the North to the Islamic agenda. The overthrow of General Ibrahim 'Abud's dictatorship in 1965 and the assumption of power by an interim government, under Sirr al-Khatim al-Khalifa as prime minister, to coach the country back to democracy within a year seemed promising for resolving the conflict in the South. Khalifa was an educator with considerable experience in the South and sympathy for the Southern cause. His government, in which respected Southerners were members, convened a conference that laid a sound foundation for Southern autonomy. However, the return of democracy and the rule of traditional parties to government retarded the progress and plunged the country back into intensified hostilities. The military rule of Ja'far Numayri granted the South regional autonomy and ensured precarious peace for a decade. His unilateral abrogation of the peace agreement in 1983 led to the resumption of hostilities. His overthrow in 1987 brought traditional sectarian powers back to power and the war continued unabated. Indeed, with the usurpation of power by the NIF in 1989 and the intensification of the Islamic agenda, the civil war of identities reached the climax that has persisted to this day. The North promoted Arabization and Islamization to establish national cultural unity, but their effect was in fact to widen the differences between the two parts of the country, escalating the conflict between them and giving it a racial and religious dimension that eventually reached genocidal proportions. Traditionally, the North saw the South as weak and underdeveloped, making it the raw material to be molded along the Arab-Islamic lines of the North. Accordingly, the stronger the South grows, the more Northerners feel threatened and the stronger their attachment to Arab Islamic identity becomes. The National Islamic Front represents an extremist reaction to the secular challenge posed by the South in general and by the SPLM/SPLA in particular. The stronger the South grows, the more Northerners feel threatened and the stronger their attachment to Arab Islamic identity becomes. Even the Ngok Dinka and the Homr Arabs, who had been a model of peaceful coexistence and cooperation on the North-South border, became pitted in a zero-sum war of identities. For historical reasons the Ngok Dinka, numbering around 100,000, a segment of the estimated several million Dinka people in the Sudan, are the only Dinka group administered in northern Sudan. This is the result of a decision made by their leaders to ensure proximity to central government protection and peaceful coexistence with Arab tribes at the North-South borders. The Homr, numerically larger than the Ngok, have cooperated with the Ngok in the past, largely due to cordial ties between their ruling families. In recent years, however, the situation has dramatically changed for the worse as Ngok Dinka youth, mostly southern-educated and Christian, have taken sides with their southern kin in the war of identities.10 Successive governments in Khartoum have recruited the Homr Arabs, trained them, armed them, and deployed them as militias, supposedly against the southern rebel movement, but in fact unleashing them against their Dinka neighbors. They killed at random, looted cattle, razed villages to the ground, and captured children and women as slaves. A leading member of the Mahdi family (that has been in the northern ruling circles for over a century) intimated that he had received inquiries from Homr Arabs, asking whether it was permitted or forbidden by Islam to kill a Dinka;11 this points to the religious intolerance and identity crisis that state intervention and the politicization of Islam have meant. Conditions of upheaval, war-related suffering, and the threat of violent death have nudged Southerners increasingly toward religion in general and Christianity in particular as a source of salvation. The southern Sudanese have always turned to God and spirits for protection at times of disaster. But as war and ensuing famine have disrupted society on a massive scale, more universalizing concepts fill the gap. The Christian church is contributing to meeting this need by offering a universal vision and also by creating broader circles of identification and unity. For example, Christian missionary groups sponsor clubs in the North for displaced Southerners, where they are allowed to operate, although with considerable scrutiny and repression, to provide religious instruction, offer literacy classes, and other social services. They shall be left together unto the fowls of the mountains, and to the beasts of the earth: and the fowls shall summer upon them, and all the beasts of the earth shall winter upon them. In that time shall the present be brought unto the Lord of hosts from a people vigorous and bright, from a people terrible from their beginning hitherto; a nation that meteth out and treadeth down. In this verse, the Dinka see their tragedy and their ultimate glory, making the gospel directly relevant to their plight. Thus has the religious agenda of the National Islamic Front become a major challenge for peace and the long-term prospects of nation-building in the Sudan. Elite circles of Christian society in southern Sudan now promote the idea that Christianity should be consciously cultivated as a key element of modern southern identity to counter the Arab-Islamic model of the North. Although the educated Christians have reason to question the manner in which Christian missionary work undermined their indigenous spiritual and religious values and practices, they now tend to identify fully with Christianity. Going to church is encouraged as both an act of faith and a political statement. In a mirror image of the Islamic practice, Southerners now open meetings with Christian prayers invoking divine guidance and support. For Southerners, Christianity is now both a religion and a political weapon against Islamization and Arabization. In the South, going to church is encouraged as both an act of faith and a political statement. Notwithstanding the rhetoric of the leadership in favor of a united Sudan, most southern Sudanese favor self-determination and perhaps eventual secession. There is, however, a serious difference of opinion on the means to self-determination. Some southern political figures, among them Bona Malwal and Abel Alier, believe that the South should rally around the right of self-determination, instead of pursuing the goal of a united, secular, democratic Sudan. The leadership of the SPLM/SPLA, in particular John Garang de Mabior, believes that such a focus would be self-defeating. In the view of the SPLM/SPLA leadership, northern leaders pay only lip service to self-determination but would never concede to the South the right to secede. Only military pressure and self-preservation will force them to make that concession. Meanwhile, the SPLM/SPLA needs unity with forces from the North to maintain the military pressure against the government. And this is only possible through the objective of a unified, secular, democratic Sudan, rather than by focusing on self-determination for the South. The SPLM/SPLA leadership believes that the best way to achieve self-determination for the South is to liberate the land physically, consolidate control, and move on with reconstruction and development rather than relying on the North granting the South the right to secede. It can, however, be argued that these two positions can be bridged. Self-determination need not be synonymous with secession; it offers an opportunity for leaders on both sides to create conditions to win and sustain unity. Given Sudan's history, this may not be possible, but it is a challenge with which the Sudanese leadership in Khartoum should be confronted. The Declaration of Principles that the mediators of the Inter-Governmental Authority for Development, whose members include the neighboring countries of Eritrea, Ethiopia, Kenya, and Uganda, presented to the parties in 1994, remains the principal normative basis for a resolution of the Sudanese conflict. The declaration can be combined into three main categories: self-determination as a fundamental and inalienable right, national unity as a desirable objective, and interim arrangements confirmed by referendum. As the South strengthens itself through education and an identity reinforced by Christianity, Western culture, and military force, its emerging parity with the North renders it less susceptible to northern disregard or manipulation. And the more seriously the South considers its grievances, the clearer it becomes that these cannot be redressed within the North's proffered Arab-Islamic framework. This means that the national framework must either be fundamentally restructured to provide for equality between North and South, or the country risks disintegration. Sudan remains poised between these choices. One thing is, however, clear: The South has unequivocally identified itself with Christianity, which means that in a united Sudan, religious pluralism will have to be accommodated. But should the South secede, Christianity will be its dominant religion. Which way the future of the country will go remains an open question. The challenge for Christianity in the Sudan is essentially political, and it has to do with the course and outcome of the war of visions that has afflicted the country for more than four decades and in which religion has become a pivotal factor and a symbol of a multi-faceted identity configuration. The crucial question is not only whether the Sudan is Islamic but also the related question of whether it is culturally and racially Arab. On both questions, the South asserts a contrasting identity that is culturally and racially black African and religiously traditional with Christianity as the dominant modern religion. Assuming the South to have a religious or spiritual vacuum to be filled by introducing outside religions, as the Christian missionaries did, is no longer accurate. Christianity has become an established element of southern identity and a major factor in the war of identities raging in the Sudan. The question then is how the war will end or be resolved. Judging from the political and military dynamics, Sudan is about to revive Christianity as both a pivotal element of southern Sudanese identity and a significant factor in the legacy of Sudanese history, where Christianity, which once prevailed in the North, has a legitimate claim to a prominent place in the religious and cultural configuration of historic and modern Sudan. Francis Deng, a senior fellow at the Brookings Institution, served as Sudan's ambassador to Canada, the Scandinavian countries, and the United States, and as minister of state for foreign affairs. He has taught at several major American universities and written books on law, anthropology, conflict resolution, human rights, politics, and folklore. 1 Francis Mading Deng, Africans of Two Worlds: The Dinka in Afro-Arab Sudan (New Haven and London: Yale University Press, 1978), pp. 130-142. 2 Wilson Cash, The Changing Sudan (London: Christian Mission Society, 1930), p. 54. 3 Charles D'Oliver Farran, Matrimonial Laws of the Sudan (London: Butterworths, 1963), p. 227. 4 Mahgoub Ahmed Kurdi, "The Encounter of Religions: An Analysis of the Problem of Religion in Southern Sudan," a Ph.D. dissertation, Temple University Graduate Board in Partial Fulfillment of the Requirements for the Degree of Doctor of Philosophy, June 1985 (Ann Arbor, Michigan: University Microfilms International and Bell and Howell Information Company, 1991), p. 183. 5 Kurdi, "The Encounter of Religions," p. 185. 6 'Abd al-Wahhab al-Affendi, "Discovering the Sudan: Sudanese Dilemmas for Islam in Africa," African Affairs, The Journal of the Royal Africa Society, July 1990, pp. 371, 387-88. 7 "The Expulsion of Foreign Missionaries and Priests from the Southern Provinces," The Black Book of the Sudan on the Expulsion of the Missionaries from the South Sudan (Verona, Italy: Verona Fathers, 1964), pp.16-17. Francis Mading Deng, Tradition and Modernization: A Challenge for Law Among the Dinka of the Sudan (New Haven and London: Yale University Press, 1971), pp. 235-237. 9 Bona Malwal, People and Power in Sudan, (London: Ithaca Press, 1981), p. 17. 10 Francis Mading Deng, The Man Called Deng Majok: A Biography of Power, Polygyny, and Change (New Haven & London: Yale University Press, 1986), pp. 40-50; 223-243, 247-281; for historical relations between the Ngok and Homr, see also Kenneth D. D. Henderson, "The Migration of Missiria Arabs into South Western Kordofan," Sudan Notes and Records, no. 1, 1939, pp. 49-77; Paul P. Howell, "The Ngok Dinka," Sudan Notes and Records, 32(1951): p. 239; Michael and Anne Tibbs, A Sudan Sunset, Lynchmere, West Sussex: Michael and Anne Tibbs, 1999), chap. 14, 15, 20, and post-script. 11 Conversation with the author, in Francis M. Deng, War of Visions: Conflict of Identities in the Sudan (Washington, D.C.: The Brookings Institution, 1995). 12 Abdullahi A. Na'im, "National Unity and the Diversity of Identities," ed. Francis Deng and Prosser Gifford, The Search for Peace and Unity in the Sudan (Washington D.C.: The Wilson Center Press, 1987), p. 76. Related Topics: Anti-Christianism, North Africa | Winter 2001 MEQ receive the latest by email: subscribe to the free mef mailing list This text may be reposted or forwarded so long as it is presented as an integral whole with complete and accurate information provided about its author, date, place of publication, and original URL.